Preheat oven to 450° F. Cut the chicken breast into bite-sized pieces and sprinkle with cumin, salt and pepper to taste. Heat a skillet to medium and add 1 tablespoon of vegetable oil. Sauté peppers and onions until tender, about 2 minutes. Remove the vegetables and add the chicken breast pieces. Sauté until light brown and cooked through, about 5 minutes. 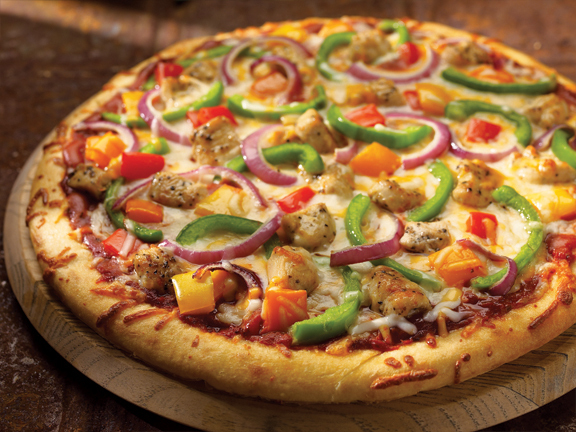 Spread pizza sauce on crust and top with chicken, vegetables and cheese. Bake on ungreased cookie sheet 10 minutes or until crust is crisp and cheese is melted.